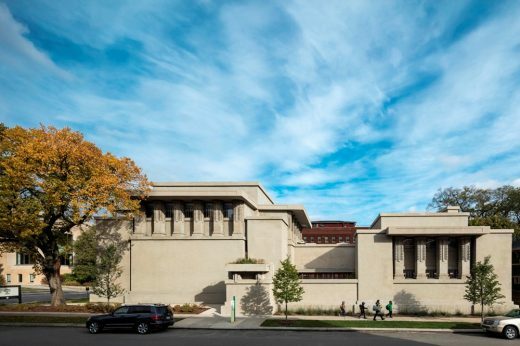 Originally completed in 1908, Unity Temple is one of Frank Lloyd Wright’s greatest works. 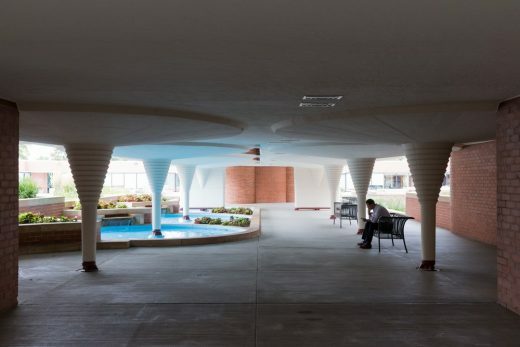 It is a National Historic Landmark and is included as one of the ten Key Works of Modern Architecture by Frank Lloyd Wright nominated to the World Heritage list. Raised as a Unitarian, Wright knew the tenets of the religion well. 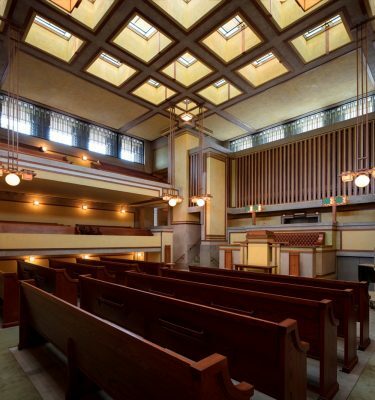 His concept for the building was to create a space for both the sacred and secular which resulted in two separate masses, Unity Temple and Unity House, connected by a lower foyer. It was a featured work in the 1910 Wasmuth Portfolio which had a profound impact on his contemporary European architects. He considered it one of his most important works and referred to its revolutionary spatial expression as his “contribution to modern architecture”. As with many religious structures, the building suffered from decades of deferred maintenance. A major renovation in the early 1970s stemmed the tide for some time, but by the millennium Unity Temple was in dire need of another major intervention. Its plight was recognized by being included on Landmarks Illinois’ 2000 Most Endangered list and as one of the National Trust for Historic Preservation’s 2009 America’s Most Endangered Places. Unity Temple Restoration Foundation commissioned a Preservation Master Plan to outline the work that needed to be done in 2006. In 2013, the Alphawood Foundation pledged a $10M lead gift towards the restoration and the project was begun. 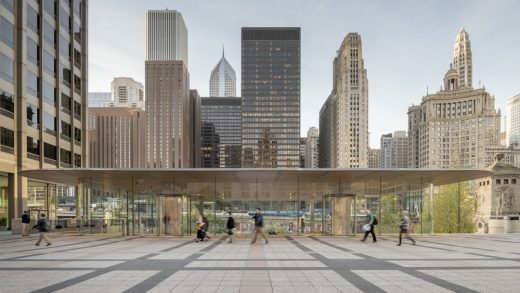 The design team, led by Harboe Architects, spent nearly a year conducting in-depth research into the best ways to authentically restore and fully modernize this international treasure. Completed in 2017, construction took over two years and involved all aspects of the building. 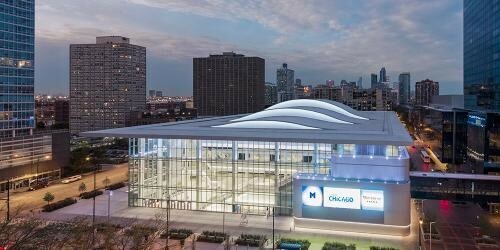 Work included extensive structural concrete repairs and new roof systems, including two large new skylights; restoration of all interior plaster, paint, and wood finishes as well as all art glass windows, laylights and light fixtures. A new geothermal mechanical system and all new code compliant electrical and plumbing systems were installed. Enhancements to provide improved functionality for the congregation and outside programming included a new catering kitchen, new programmable LED lighting, new audio visual systems and ADA accessibility. The project included many challenges for the design and construction team to overcome but can be summarized into three major parts. First was carefully matching new concrete repairs to the color, aggregates and texture of the existing exposed exterior concrete. 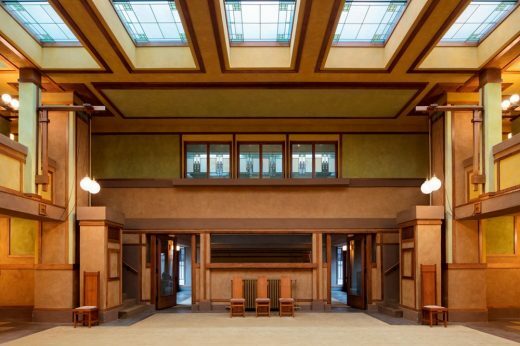 Second was recapturing Wright’s original glowing interior spaces by replicating the original plaster and paint finishes. And third, was the seamless insertion of all the new building systems required to accommodate improved functionality without any adverse visual impact on the building. 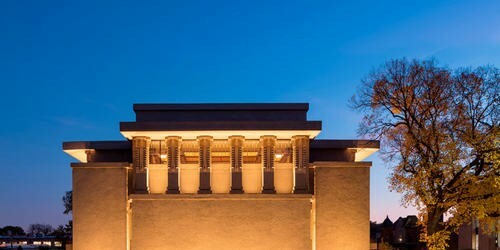 The transformative restoration of Unity Temple not only returns this internationally significant work of architecture to its original appearance but gives new life to a building that will allow it to continue to successfully serve its original purpose as a house of worship for its congregation as well as a tourist destination for Frank Lloyd Wright enthusiasts from all over the world.